The Omron HJ-720ITFFP pocket pedometer is one of the advanced models offered by Omron. The pedometer comes equipped with features that allow users to stay motivated and maintain their health goals. If you are looking for an innovative pedometer, then this pedometer makes for an ideal choice. The large LCD display screen includes a weekly review of exercise history and automatically resets at midnight. The pedometer also includes a detachable belt, USB cable, battery, and security strap. The pedometer uses a dual-axis accelerometer technology to accurately keep step count. The dual-axis technology also tracks and stores information that can be downloaded through the Health Management Software, offered by Omron. The software gives users the chance to see their blood pressure and pulse through a graph available on their PC, which is an effective tool for tracking overall health. The Omron 720 model can be purchased for around $50.00, which can be a steep price for a pedometer. However, the tools and benefits this pedometer offers make it worth the price. The Health Management Software is a great tool to keep track of overall health. The software comes with multiple graphs, including a blood pressure and pulse graph and a morning/evening comparison graph. The software is easy to use and the USB that comes with the pedometer allows users to easily download workout data, which will appear on PC screens in seconds. The Omron 720 does not only count steps, it tracks calories and fat grams burned through the display screen. This is a great tool for users who are looking to shed unwanted pounds because it keeps track of calories and fat grams burned accurately, which is not available through basic pedometers. The pedometer has a large LCD display screen, so the information is easily readable to users. The display screen also comes with a one week workout history display, so users can easily access their workouts the past week without having to connect to a PC. The pedometer comes with a detachable belt, and it also resets automatically at midnight. The pedometer’s display screen is a great feature that make it easy to stay consistent with progress and goals. The 720 model is accurately records steps, and does not count “junk steps.” Unlike other pedometers, the 720 can accurately record steps around the waist or neck and in shirt pockets. The 720 can accurately count steps, regardless of the users positioning, because of Omron’s dual-axis technology. The dual-axis technology can be positioned vertically or horizontally, and it still counts steps accurately. This pedometers cutting-edge technology make it easy to use with great accuracy. 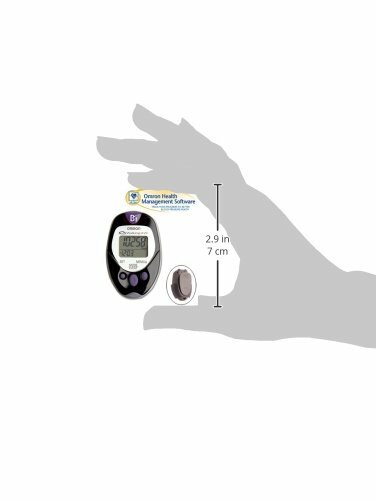 Most other pedometers offer a 30 day memory, but this model offers 42 days of stored memory through the Health Management Technology. This model offers more than counting steps. The Omron 720 pedometer offers several tracking modes such as steps, aerobic steps, distance, time, calories burned and fat grams burned. The range of tracking modes the pedometer offers make it easy for users to add variety to their workout. Although the pedometer comes equipped with Health Management software, it is only available through Windows 2000, 7, XP, and Vista through a PC. The Health Management software is not available for Mac users, or Windows 8 software. The Omron 720 is a larger pedometer, and this can be a problem for some users. The size of the pedometer is 7 x 4.5 x 2 inches, so if users are looking for a small pedometer the 720 may not be a good fit. The Omron HJ-720 does not have a reset or on/off button. If users want a pedometer they can reset before workouts, then this may not be an ideal pedometer. The pedometer does not turn off and resets at midnight, but automatically saves the workout from the previous day. The Omron HJ-720 is overall an excellent pedometer that is easy to use, and it allows users to keep track of their progress through the Health Management Software. Users can easily stay motivated by downloading their progress to their PC. This pedometer uses advanced technology to enable users to accurately monitor their overall health and workouts. Although the pedometer is expensive, it comes equipped with many features that make it worth the purchase.